Mary J. Blige has no problem singing about her personal battles, which include substance abuse, childhood abuse, relationship woes and insecurity issues. In her latest work, the best-selling album, "The Breakthrough," Blige shows she still struggles to stay on the right path. "I'm trying to walk the walk but this is hard," says Blige, her tinted sunglasses unable to hide the emotion in her eyes. "I don't want to be falling flat on my face in front of you guys, but I might fall flat on my face in front of you because the process of healing has started." "And when the healing starts, the correct healing, it all hurts, because you're running straight into pain," she adds. 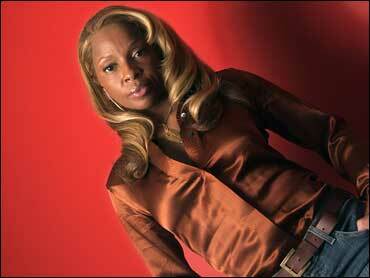 Singing about her struggles has brought better record sales for Blige. When "The Breakthrough" was released in December, it shot to No. 1 with the best sales of her career, and so far has sold about two million copies, her most successful record in years. Blige's previous album, 2003's "Love & Life," was produced by her former mentor Diddy, who wanted her to go in a more dance-oriented, less personal direction. Blige wanted to sing about the struggles in her marriage, but eventually acquiesced to Diddy. Unfortunately, the album saw mediocre record sales. Blige calls the experience a hard but valuable lesson. "I learned to never ever ever go against what was in my heart," she says. "This is not something I can blame on anyone around me, but I have to learn from the fact that - gosh, I've really got to pay attention to what's in my heart, instead of what people say." So when she began work on "The Breakthrough," Blige made sure she included songs like "Good Woman Down," urging women to break free of abusive relationships, as Blige has done in the past, and "Father in You," in which she reveals how even as a grown woman she suffers from the lack of having a father in her life. Even though Blige projects an image of a glamorous and confident diva, she insists that when she looks in the mirror, she sometimes still sees the damaged soul from her past. "People wanna say, 'Well, she's singing about love, so how's she insecure? BECAUSE I AM INSECURE!" she exclaims. "Every seed that was planted in your head from a child is what you grow up with and you carry around with you until you can get some help for it or until you can actually see what you're doing to yourself." And that's why Blige still talks about the pain and hurt. "I'd rather deal with the pain of getting better than deal with the pain of staying sick. Because it's pain either way," she says.